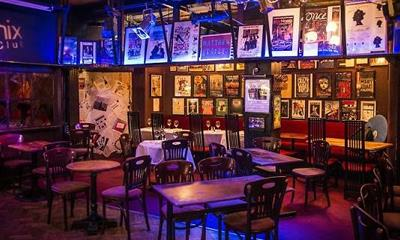 Lively and nostalgic theatre bar & Restaurant located in the original dressing and rehearsal rooms of The Phoenix Theatre where Laurence Olivier made his debut on stage in the 1930s in "Private Lives" with Noel Coward and Gertrude Lawrence. With fascinating signed posters, paintings and pictures from decades of theatre productions, a restored art deco interior and hidden treasures lurking in every corner, there's something new to see on every visit, and you never know who might decide to give an impromptu performance! Recently voted the 'Restaurant of the Year', The Phoenix Artist Club is the perfect destination for a dedicated evening, or a speedy pre-theatre meal.